A new UCLA-led study has found that taking the female hormone estriol together with conventional medications benefited women with relapsing-remitting multiple sclerosis (RRMS) by preventing relapses. The findings were published online on November 24 in the journal Lancet Neurology. The results of the phase II randomized, placebo-controlled study were truly translational. The researchers took observations from the bedside, tested them in the laboratory and took those findings back again to patients in clinical trials, explained lead author Rhonda Voskuhl, MD, a professor in the UCLA Department of Neurology and director of UCLA's Multiple Sclerosis Program. It is well-known that during the second half of pregnancy, women with RRMS have reduced relapses; however, the reason was unclear. It is also known that during this period the fetal placenta produces estriol, increasing the hormone levels in the blood. This protection during pregnancy occurs not only in MS, but also in other autoimmune diseases such as psoriasis and rheumatoid arthritis. Dr. Voskuhl took this information to the laboratory. She theorized that increased estriol in the blood might play a role in suppressing a woman's immune system so that the fetus is not rejected as being foreign (because it has half of the father’s proteins). This temporary suppression of the immune system would be good for pregnant mothers with autoimmune diseases. 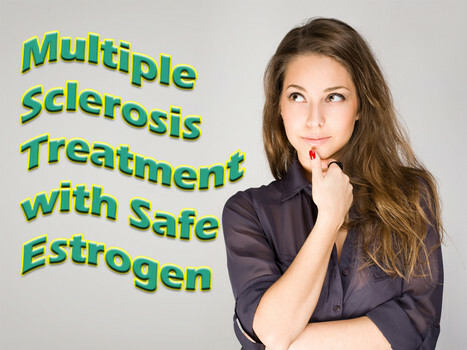 The researchers found that treatment with estriol was protective in the MS model. That led to a successful pilot clinical trial in 2002 at UCLA and then the Phase II trial, launched in 2007 at UCLA and 15 other sites across the nation. Multiple sclerosis is an autoimmune disease of the central nervous system in which immune cells from the blood attack the tissue surrounding the brain's nerve fibers, known as myelin. This tissue is similar to the insulation wrapped around an electrical wire. When the myelin is damaged, it interferes with the ability of the nerves to send signals to and from the brain, resulting in symptoms including cognitive problems, difficulty with walking, poor vision, and other disabilities. In RRMS, clear episodes of inflammatory activity, or relapses, occur. During a relapse, there are new or worsening symptoms, accompanied by inflammatory lesions in the brain. A relapse can range from several days to months, and are usually followed by remission, or improvement. However, some residual symptoms may remain, and after many years individuals with RRMS often transition to a progressive form of the disease. During the progressive phase, there are no longer relapses; instead, there is gradual worsening of permanent disabilities and loss of brain volume or atrophy. In the laboratory, the researchers discovered that estriol potentially provides a one-two punch against the disease, both reducing the ability of immune cells to attack the brain, while also making brain cells more resistant to damage if any immune cells do make it through. Specifically, they found that estriol treatment improved cognition and prevented atrophy of the cognitive region of the brain. It appears that during pregnancy, estriol can both suppress the immune system and protect the brain; it is not only is it important to avoid rejection of the fetus as foreign but also is critical to protect the developing fetal brain. While these two effects may be designed to protect the fetus, they may also serve to benefit women with MS. In 2002, Dr. Voskuhl completed the pilot study, in which 10 non-pregnant women with MS were given estriol. That resulted in a more than 70% decrease in inflammatory lesions in the brain within only six months of treatment. In the Phase II study, the investigators enrolled 164 patients, with 83 assigned to the estriol group and 81 to the placebo group. Both arms continued their conventional medication, injectable glatiramer acetate. The researchers found that the patients taking estriol had a third to a half as many relapses compared to those taking the placebo, with this improvement occurring over and above that provided by their conventional treatment. Furthermore, when estriol levels were the highest, there was improved cognitive function and less atrophy of the brain area related to cognition. The treatment was well tolerated during the two years the women took estriol and the only significant side-effect was irregular menstruation. To date, there is no FDA approved treatment for MS that improves disabilities.